I am working on an assignment where I need to setup a webservice in Salesforce. The other system will have a search screen on their side and they should be able to search Salesforce for list of accounts given a partial account name. As a POC, I developed a simple REST webservice. The code is below. 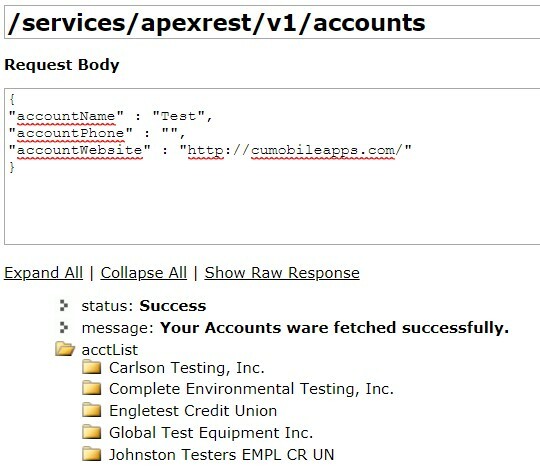 The above service is working fine from workbench when I call with EndPoint URL /services/apexrest/v1/accounts and with the request message. However, when I call the same service with the same request message from SoapUI, I am getting a null response as shown below. Below is the screenshot of the response from Salesforce workbench. I am stumbled as to why this is happening. Has anyone faced this issue before? Any help is appreciated. Debug logs when calling from soap ui is below. Debug logs when calling from workbench is below. This appears to be a record-level visibility issue. Your web service class is running with sharing, which is good. The authenticated context user's record-level visibility will be applied to query results. I am confident that that's our culprit: the SoapUI user does not have record-level visibility to the test Accounts you are using. Easy fix to prove this is true: give that user the View All permission on Account and see what happens. Not the answer you're looking for? Browse other questions tagged apex rest-api apexrest workbench or ask your own question.